Marketers always want more email subscribers. The Bronto Pop-Up Manager gives marketers a visual editor for creating, testing and managing pop-up sign-ups. The app was first introduced in 2013 and according to Bronto is one of their most popular apps among users. With the new version recently released, several features were added. 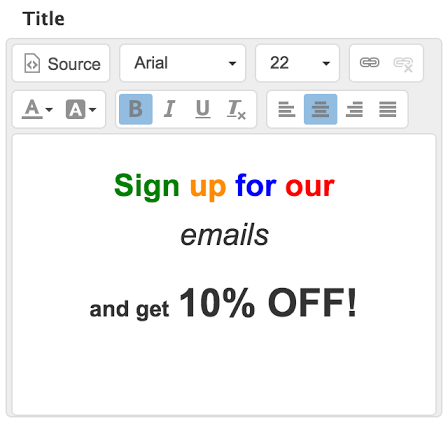 When creating new pop-ups, marketers can use a rich text editor for the text areas. It is possible to completely style the pop-up and edit the HTML source for extra styling. Specific support has been added for the img and the link tag (making it possible to use Google Fonts) The color picker now has the capability to select a transparent background, and is able to adjust opacity with a slider. As you can see, this will allow any marketer to make their pop-ups inline with their own website branding and design, however beautiful or ugly that may be. Marketers can now use “Include URL Paths” to make targeting specific pages easier, instead of having to enter all possible exclusions. The Cookie Policies section has a new setting for Cookie Uniqueness. The options are Domain and Pop-up Version. Domain was how things were functioning up until the new version and is still the default setting. This means the cookie is created for the domain and would stop someone from seeing the pop-up again even after you deploy a new version. Selecting Pop-up Version means the cookies are specific to each version so you could deploy a new pop-up version for the holidays and make sure everyone sees it. Now it is also possible to deploy multiple pop-ups on the same site, you can now do that. An example that bronto gives is a marketer to display one pop-up to only when someone clicks the email signup box in the footer, while also having a separate pop-up displayed as usual. Also support for Multiple subdomains and multiple top-Level domains has been added.